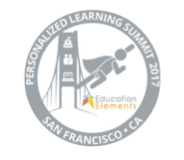 From May 10th-May 12th, Sam Kurtz, Associate Principal of Shepard Middle School, and I attended the Personalized Learning Summit organized by Education Elements in San Francisco, California. This three-day conference exposed us to the philosophy behind personalized learning which will help us move beyond PL as merely an education buzz word. The conference began with tech company tours of innovative companies located in the heart of San Francisco. Sam and I visited AutoDesk, a company that creates design software for “people who make things.” In District 109, we are familiar with AutoDesk’s online design platform for 3D Printing called Tinkercad found in many of our school libraries. As we explored the layout of the company’s headquarters, we were struck by the comfortable seating options, open-air cubicles, collaboration suites, and treadmill desks. When we think about personalized learning, we must first think about the environment we create in our classrooms to allow for this type of personalization. Our students will ultimately join a workforce where they will have autonomy over where they complete much of their work. Seeing an actual 21st-century office space was confirming to us that rethinking our classrooms to provide students with more voice and choice will help prepare them for their future. During the conference, we had the privilege of hearing two incredible keynote speakers: Brad Montague, creator of Kid President and Kaya Henderson, former chancellor of DC Public Schools. Both speakers gave important messages to all of us as educators. Brad reminded us that “you were once a child, too.” As we think about our classrooms, it is important to ask ourselves if we would want to be a student in our own classrooms. If the answer is no, it’s time to make some changes. Kaya suggested that we customize a personalized pathway for each child and warned us not to “just put students in front of technology so that they can go faster or slower with the content.” This was a common theme that emerged throughout the conference about technology. Although technology can make personalized learning easier to manage for a teacher, personalized learning is not about the technology. It’s about the pedagogy that teachers use to personalize the learning experience for her students. Building teacher capacity will be a necessary next step for teachers to engage students in personalized learning. During the conference, the National Academy of Advanced Teacher Education (NAATE) shared five competencies of effective personalized learning educators. These competencies would help any organization guide their teacher development programs to ensure that all students receive a strong personalized learning experience. 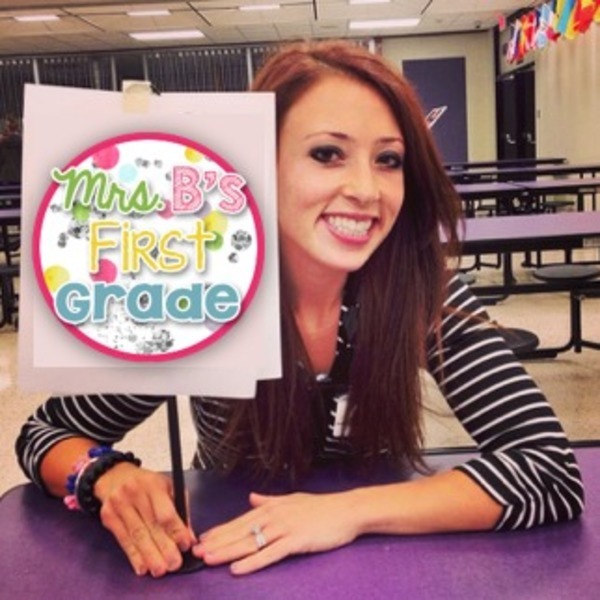 What is next for District 109? Now that we know that personalized learning is more than just a buzz word, we are challenged with bringing awareness and support to all District 109 teachers. 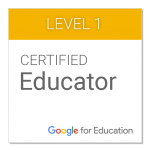 The is an exciting time in education, and we look forward to finding more and more opportunities to personalize learning for our students and teachers in District 109. On Thursday, December 15th, ten members from the District 109 Leadership Team traveled almost four hours north to Weston, Wisconsin to visit D.C. Everest Middle School. Our experience, though short in length, was rich with ideas that we hope to implement in District 109 in the near future. D.C. Everest Middle School, led by Principal Casey Nye, gives many students a personalized learning experience. Students have the opportunity to select when they take their courses and choose how they learn new information. Flexible learning spaces support this innovative approach to learning, where teachers are facilitators of learning rather than keepers of content knowledge. Check out this video that gives a brief snapshot of what it’s like to be a learner at D.C. Everest Middle School. On Thursday, January 21st, several middle school teachers from District 109 had an opportunity to visit two school districts using iPads and Macbook Airs as their 1:1 device for teaching and learning. Berwyn South District 100 and Barrington Unit District 220 graciously welcomed our team from Deerfield on a visit to observe how seamlessly the iPads were regularly integrated into daily instruction. Our visit mainly focused on how a tablet device, such as the iPad, impacts the learning experience for students. 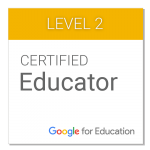 As a predominantly Chromebook 1:1 program, our teachers in Deerfield have expressed curiosity about how other school districts use technology with students. At Berwyn South and Barrington, we quickly noticed that students with iPads were producing, rather than consuming, a great deal of creative content. Students used various iPad apps to create digital presentations, screen recordings, and videos to showcase their learning. The Deerfield team that attended these site visits represented a majority of all content areas in our middle schools: English Language Arts, Math, Science, Social Studies, Physical Education and Foreign Language. Because the Chromebooks used by Deerfield students do not have a touch interface or video camera, many of our math, PE, and fine arts teachers have expressed concern that the Chromebooks have been a rather limiting device. Our team will be sharing our observations with other teachers in District 109 as we explore the future 1:1 devices for Deerfield students. While no decisions have been made at this point, we are studying how a different device may impact the ways in which teachers instruct students and students demonstrate learning in the 21st-century classroom. The video below showcases several highlights from our visit. Special thanks to Apple, Berwyn South District 100 and Barrington Unit District 220 for hosting our teachers! In Waukesha, Wisconsin, many schools have begun using a personalized learning approach that gives students voice and choice in much of their learning. With ubiquitous access to technology, personalized learning will undoubtedly be the wave of the future in terms of how we educate students. Traditional lessons with teachers lecturing full classrooms of students all at once will be rare as students begin learning at their own pace, while engaging in authentic experiences that won’t just mimic the real-world; they will be for the real world. I had an opportunity to speak with some middle school students at FLIGHT Academy, which is a school-within-a-school model at Horning Middle School in Waukesha. Take a few minutes to watch this video and listen to the way that students and teachers talk about learning. While students at FLIGHT Academy are still working on academic skills, they are also practicing life skills such as time management, self-direction, communication, collaboration, problem-solving and perseverance. In traditional classrooms, teachers work so hard to support students that they often protect students from experiencing failure. In personalized learning environments, because students truly are responsible for their own learning, the philosophy is for students to fail forward in order to learn and grown from mistakes. In DPS 109, we will continue studying ways to bring personalized learning into our classrooms to give students more voice and choice in their daily learning. Some of our teachers who also attended the site visit have already begun this journey, and we hope to highlight their great work in the coming months. 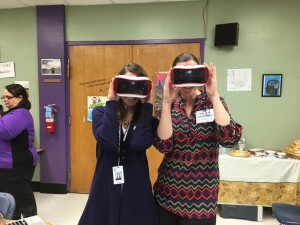 Recently, our middle school librarian information specialists, Andrea Trudeau and Sheila Shiffrin, joined me on a visit to Hillel Torah in Skokie, Illinois to experience Google Expedition. The Instructional Technology Director of Hillel Torah, Beth Pollick Burke, happens to be DPS109 parent, and she graciously extended the invitation to the three of us to experience this exciting new technology in action. Google Expedition is a virtual reality experience that uses a special viewfinder and Android phone that create a 360-degree panorama view of some part of the world. Controlled by a tablet, the teacher can take students to places around the world that students could never feasibly visit on a typical field trip. The students at Hillel Torah used Google Expedition to visit the Roman Coliseum, coral reefs, and Galapagos Islands. 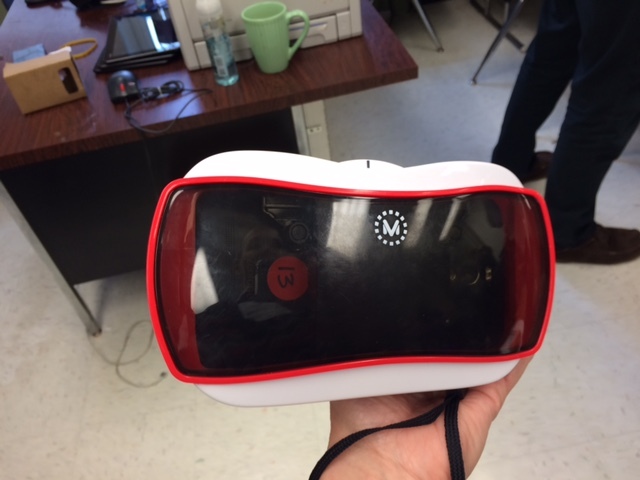 Students shrieked with delight each time they looked through the viewfinder to explore a virtual world. This type of technology can extend learning by allowing students to be transported virtually to a new location and explore details that go beyond textbook reading. Teachers guide students throughout the expedition so that they know what to look for and how it applies to the learning within the classroom. While we thought this was a very exciting idea, I fear that the novelty may wear off rather quickly. There is no student choice in these expeditions since the teacher controls the entire journey. I also found that while the 360-view was pretty cool, there is only so much one can see. In my opinion, this first iteration of virtual reality field trips is fascinating, but as emerging headset technologies continue to develop, the experience may ultimately be more worthwhile when students can choose their expedition, explore more deeply in the expedition, and interact with the virtual environment. We probably won’t be rushing to purchase these devices, but we were grateful for the opportunity to see Google Expedition first-hand. Special thanks to Beth Pollack Burke for the invitation! Mike Lubelfeld, Amy Rubin and I visited Hamilton County Schools in Hamilton, Michigan yesterday to observe an incredibly innovative approach to teaching and learning. At Hamilton Middle School, a handful of teachers are cultivating scientists, historians, business leaders, museum curators, and more, all through a project-based approach in their school-within-a-school called STREAM School. STREAM stands for Science Technology Reading Engineering Arts and Mathematics, and learning comes alive for all students in this incredible program. In this environment, students lead the learning from start to finish, with teachers serving as facilitators and advisors along the journey. Authentic audience, natural community partnerships and shared vision among all stakeholders are what makes this program incredibly successful. Students at STREAM School internalize their learning on a completely different level than what we tend to see in most traditional classrooms. Take a look at the video below to get a little taste of what STREAM School has to offer these middle schoolers. The big question for District 109 is how can we bring this hands-on approach to learning into our classrooms? The answer lies within the small pilot groups that we are igniting around the District. Beginning this January, we will have 12 teachers utilizing a platform called DefinedSTEM, which “enables teachers to provide application of knowledge to students through the use of project based learning, real world careers, and meaningful reading and writing activities.” (Learn more at DefinedSTEM.com) We will be following this group closely on this blog to share how these experiences are impacting student learning and engagement in each of the pilot classrooms. Stay tuned for more information on our DefinedSTEM pilot. A huge thanks to Hamilton’s Superintendent, Dave Tebo, who spent the entire day with my team giving us the grand tour of the exciting work taking place in Hamilton. Learn more about STREAM School by visiting streamschool.weebly.com and following them on Twitter at @STREAMschool. On Monday, October 26th, a group of DPS109 building administrators and teacher librarians from all six of our buildings attended an afternoon field trip to Hubbard Woods School in Winnetka District 36 and then to Central School in Wilmette District 39. The purpose of our trip was to explore and inquire about non-traditional library spaces. We began our trip at Hubbard Woods School, led by Maureen Miller, the Director of Technology in Winnetka. Maureen provided background about the Resource Center of Hubbard Woods, which was completed transformed over the summer by Todd Burleson, the Resource Center Director. The space was truly incredible. Upon entering the space, whiteboards line the walls to encourage students to share their thinking and ideas with others. A lego wall also welcomes students to the Resource Center, suggesting that this is a place to create. 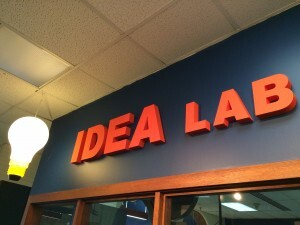 Students have opportunities to engage in design thinking experiences in the Resource Center, where they ultimately prototype their ideas by building, making and creating a model that solves some kind of problem. Todd has traditional library sessions with students on Mondays, but the rest of the week is devoted to project-based learning. Students have access to iPads, robots, building tools, a green screen studio, and more! Our group was blown away by Todd’s innovative approach to library. He clearly is a leader in his field and has reimagined what a library can and should be. While we loved much of what Todd does in his library space, this would be difficult for any library to do without having Todd leading the charge. Todd is as handy with a saw as he is with the Linux Operating System! Still, our eyes were opened to the potential of a newly designed space where kids come to learn through creation. Learn more about this unique library space by clicking here. 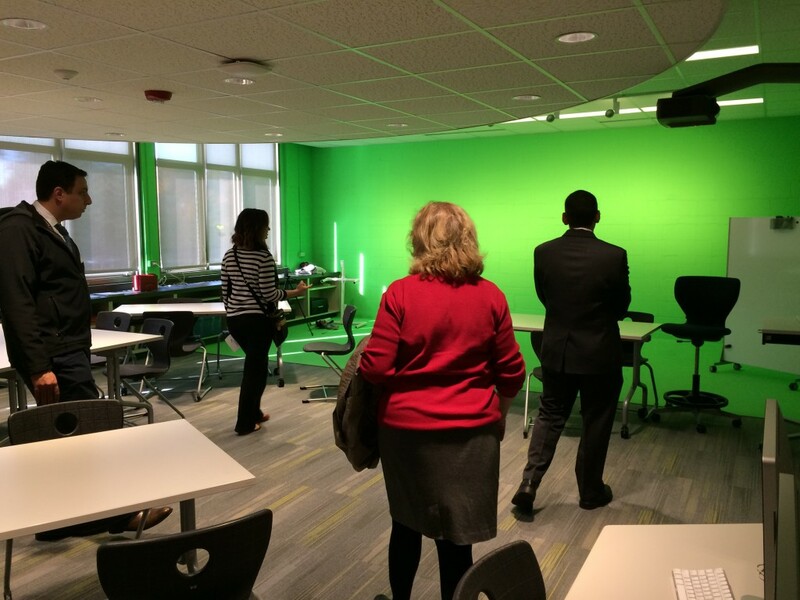 After leaving Hubbard Woods, we drove about ten minutes south to the Central School Learning Commons in Wilmette, where Barb Unger, the Library Information Specialist, and Lauren Kolod, Technology Teacher, gave our team a tour of their newly renovated space. Several classrooms were converted into different spaces that could be used for various purposes in the Learning Commons, so multiple classrooms of students could easily visit the LC without it ever feeling crowded. In addition to the traditional library space with soft seating and books, the Learning Commons incorporates Makerspaces, Green Screen recording studio, a technology lab and several collaboration suites. Both Barb and Lauren were passionate about how the new design has reinvigorated their passion for what they do. Students still attend some classes in the Learning Commons on a fixed schedule, but teachers can easily bring students into different parts of the LC at other times during the day and tie the learning back to what students are working on in the classroom. Learn more about this exciting space by clicking here. To summarize our visit, it was clear to us that the DPS109 library spaces need more hands-on experiences for all of our students and more flexibility in our schedule to allow for such experiences. Many of our elementary schools are exploring the possibility of adding a Smart lab into the library space to bring hands-on learning to our upper elementary students. Our librarians have already begun bringing aspects of makerspaces and project-based learning into the library so that students view the library as a place of curiosity, inquiry and student-driven learning. Now that information is ubiquitous, a library is no longer the only means for book check-out and research. If we know this is true, then we must continue to ask ourselves: What else can we do in this space to bring relevance, meaning and purpose to the learning experiences of our students? We will continue investigating what kinds of opportunities could be brought into a library space to keep students engaged, inspired and empowered. We look forward to revolutionizing these spaces in the upcoming years to best prepare our students for their tomorrow. Last week, Marcie Faust and Andrea Trudeau visited Steelcase University in Grand Rapids, Michigan, to take a closer look at how modern learning spaces can impact student learning. District 109 is committed to rethinking classroom design, and this visit to Steelcase, along with an earlier visit made by Eileen Brett and Andrea Lathan, was a first step toward shifting some of our current classroom and library spaces to create environments that will foster active, engaged learning. Take a quick glimpse of the video below sharing parts of their visit to Steelcase and think about how some of these new environments could support transformed learning for the students and teachers in District 109.